Recreating the world as we see it with our own eyes. Learn more about crystal-fidelity. The Printer that's equally obsessed. Learn More! Professional photographers openly share what they need, want, and even don't want in a printer. Like stunning black and white prints with deep blacks and detailed gradations. 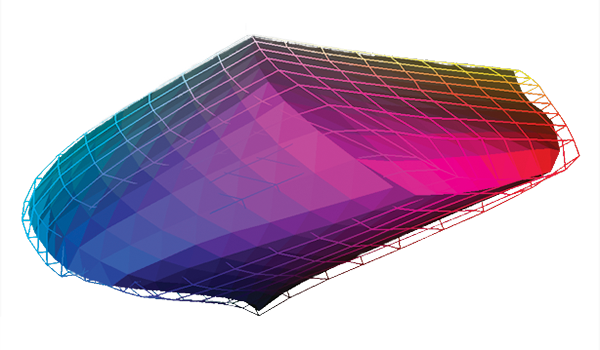 A wide color gamut that accurately reproduces even the most difficult colors. And at Canon, we listen. 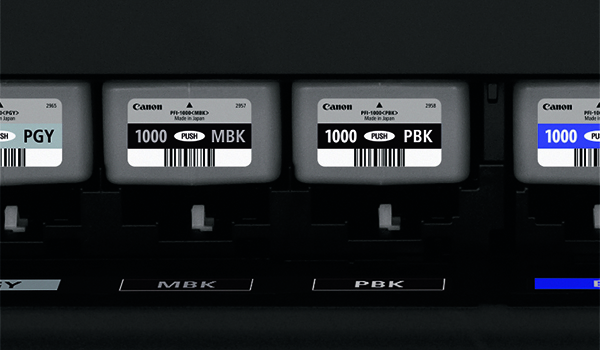 Introducing the Canon imagePROGRAF PRO-1000. A 17" wide format professional printer with an 11-Color plus Chroma Optimizer ink system that does it all. Arguably one of the best printers we've ever engineered. Distinguished by a bold red line. The FINE print head institutes a tubular ink delivery system. This generates faster print speeds and reduces the possibility of clogging. Additionally, ink ejection conditions are precisely checked with sensors, and if a clog is detected, another nozzle automatically provides backup. 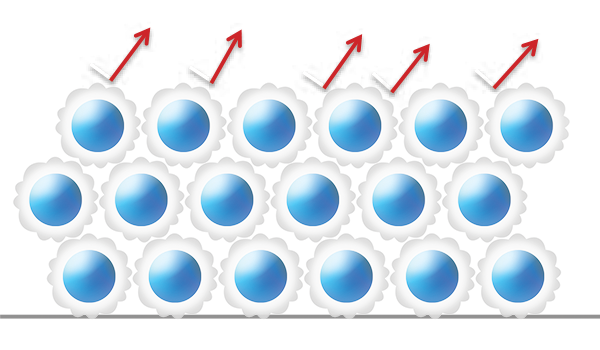 In addition to preventing wasted prints due to clogging, this also reduces the frequency of which nozzle cleaning is required. 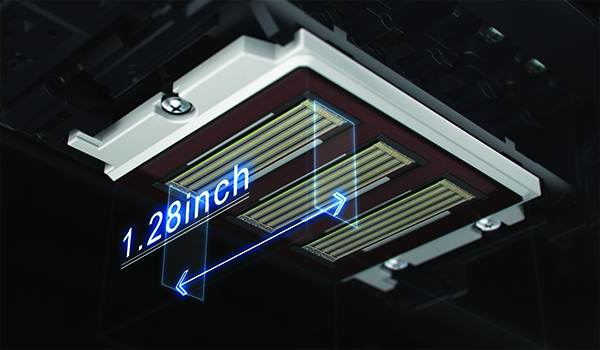 Engineered with 18,432 nozzles and sensors that continuously monitor status and deliver optimum results. The Canon Air Feeding System prevents each page from skewing for accurate ink placement, regardless of paper type. A series of openings located on top of the platen vacuum-grip the paper as it feeds through the printer. The Air Feeding system creates a printing environment that keeps a consistent height between the print head and the media being used. Variances in height can occur due to paper curl or variations in temperature and humidity. A consistent level surface leads to remarkable ink droplet accuracy and improved image quality. A series of openings located on top of the platen vacuum-grip the paper as it feeds through the printer. Skew Correction function guarantees that all types of paper, including thick fine art type papers, can be fed without the need for reprints. Utilizing new pigment ink with modified compositions and new colors, LUCIA PRO INKS have enabled a broader color gamut and greater shadow detail reproduction in dark areas. • Increased density of ink on the paper improves color gamut. • Even light reflection contributes to improved glossiness and image clarity. • Contributes to anti-bronzing on glossy paper. Deep blacks, which make the image crisp, and precise gradation can be attained across all media types. On glossy media, light reflection off of a printed image is stabilized by the Chroma Optimizer and the newly formulated Photo Black ink. Overall, your images will enjoy an enhanced dynamic range. The print head, ink and image processing engine mounted on the imagePROGRAF PRO-1000 provide high levels of image quality and productivity. 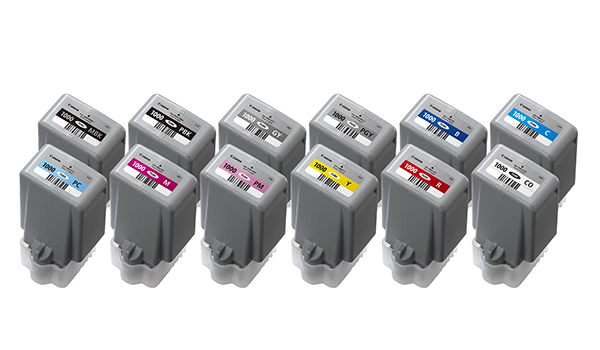 A new ink system adopts 11-color inks and Chroma Optimizer ink. This system helps you achieve an improvement in color-reproduction, image clarity, and enhanced darker areas. It faithfully reproduces colors and dark areas crucial for printing works of art. The newly formulated blue and magenta inks will help recreate the finest details when printing nightscapes and sunsets. On other printers, switching from Matte Black to Photo Black consumes a significant amount of ink and time. 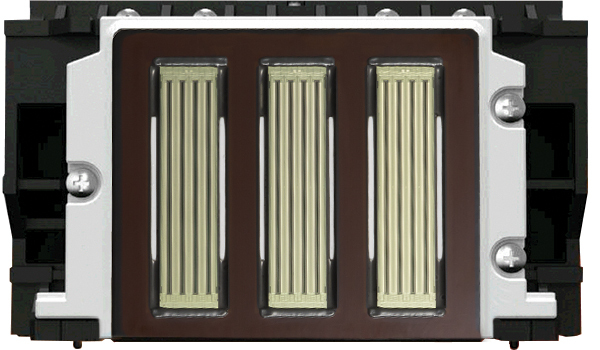 The imagePROGRAF PRO-1000 is designed to work seamlessly when changing media types. Matte Black and Photo Black inks have their own dedicated nozzles, so no switching is necessary. You can print on fine art paper then glossy paper with no worries, no changes, and no waste. At the heart of the imagePROGRAF PRO-1000 is a 1.28" wide print head. Expanding the printing area by 50% with each movement of the print head, print speeds are drastically improved. This increases your productivity through efficient high-speed printing. This high-precision control engine performs the high-speed processing of massive volumes of image data, generates the printing data, and controls the optimal ink layout for the purpose of achieving high resolution prints. It represents the brain of the imagePROGRAF PRO-1000. 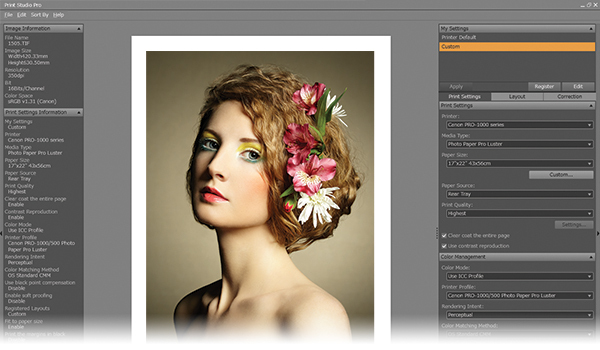 This powerful plug-in software provides professional photographers with intuitive printing solutions. New functions added provide enhancements to your printing workflow. By using this function in combination with the Digital Lens Optimizer included in Digital Photo Professional, you can print sharp, high-definition images without losing any of the qualities present when the image was photographed. Allows for visual proofing of the final print, taking into account for color reproduction for a specific paper type. Enjoy intuitive operation and settings such as Favorites, History, and several Color Adjustment Functions. Seamlessly works with leading image editing software programs. Allows for 16-bit processing of images to dramatically improve your final output. 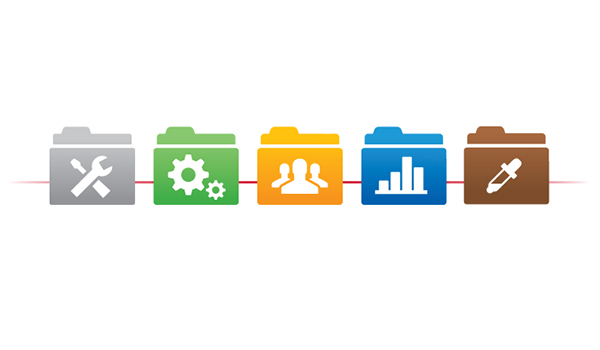 Provides quick access to all the Printer Management Tools. Enables complete customization of the media menu in both the driver and the printer by re-arranging paper types, hiding unused media, and even creating a custom set of printer parameters for your preferred media. Adjustments such as print head height and vacuum strength can be manually entered and saved. Account for every sheet of paper and the amount of ink that was used. Accounting Manager allows you to accurately assign and track the costs of every single job. 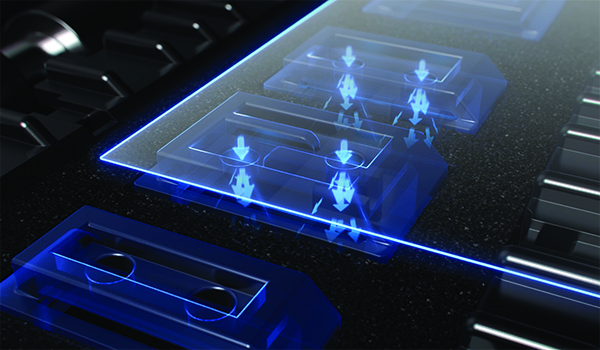 The Device Management Console allows you to manage multiple printers, all in one convenient place. Monitor, control and calibrate imagePROGRAF PRO-1000 printers regardless of location to ensure the consistency that you demand from your printers. The Color Calibration Tool enables you to ensure the quality of each and every one of your prints, regardless of which imagePROGRAF PRO-1000 in your studio you are printing on. * Printer Management Solution software tools will become available starting in December 2015.Please check usa.canon.com/proprinters for the approximate timing of availability for each software tool. Specifications are subject to change without notice. All printer output images are simulated. For the temperature and humidity conditions of papers such as photo paper, refer to the paper?s packaging or the supplied instructions.